Different HTML markup for Structured Data Rich Snippets? 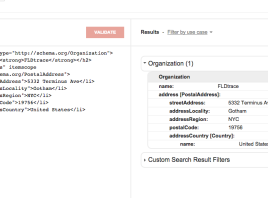 Can I change the default html for Structured Data Rich Snippets? For some reasons you may need to change the div and span HTML that comes with the default Rich Snippets. For example you may want to have a list instead or your Visual Builder strips out the span. In this case please see below the solution. Does altering the HTML for Rich Snippets work? Using the Structured Data testing Tool we can test the new format and as you can see below it still validates. Now you can go and use any HTML instead of default div and span as long you include the itemscope and itemprop schema. I hope this helps anyone looking for this. Please consider reading next my other article why SEO friendly coding is good for your website.